All of our work is built on four fundamental principles that drive our projects and partnerships. Each step in our storytelling process is connected to those principles. One of the most important steps is our Discovery Process. Our Discovery Process is a funnel that gets whittled down to our outputs. Typically this exercise takes place at the project strategy level, but it is really dependent upon the type of project. 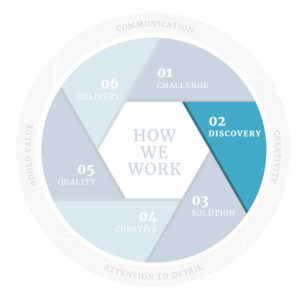 The Discovery Process is ongoing throughout a project as ideas and challenges arise. What audience are they are trying to reach? What message do they want to tell the audience? What do they want the audience to do after getting the message? What mediums are they currently using to reach the audience? Sometimes the client is able to bring great detail to the Discovery Process, more often it is the first time they’ve thought about these questions. Typically, the client wants their audience to take a specific action but they haven’t thought about how to communicate that or how to motivate the audience. Our goal in the Discovery Process is to try to get all the bits of information down on to paper and use it to inform what we’re going to do next. It is a collaborative, workshop meeting. After we get a sense of the client’s goals, we look at the resources we have available and possible limitations to the projects. Sometimes there isn’t staff capacity to execute the project as envisioned. Other times the technology may not be in place to implement a digital solution as intended. We look at what materials the client already has in the pipeline to use, get an understanding of where they may need additional resources and then put our recommendations into our solution. The Discovery Process is a collaboration with our clients that lets us listen to them, brainstorm ideas, challenge conventional thoughts and create a solution that exceeds their goals. After we work through the Discovery Process we provide our clients with an executive level summary of what we heard, where we see gaps, and an action plan on next steps to move on a strategic communication plan. We gather in the Workshop and clients let us know where we hit the mark, where we need to talk more, and where we brought ideas they had never thought of! The most important thing for us to come out of the discovery phase is understanding what the project champion or owner envisions as success. Something, somewhere along the line made this project a priority and we want to know what that is, how it is measured and what will determine success. Just like peeling an onion, the Discovery Process allows us to get at what the client truly wants, after they tell us what they want! Are you ready to discover your next project? Let’s talk!